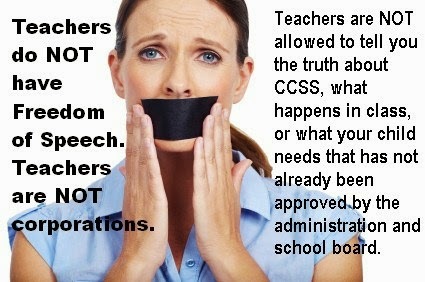 I recently blogged that my school district has a gag order on teachers discussing opting out of Common Core testing. What I've discovered is much more insidious. I explained to my daughter that I'd rather her not take these tests. (As a teacher I believe these tests will be used to dismantle teaching staffs, in order to replace them with cheap labor. It also turns teaching into test prep and eliminates the joy of learning.) I expected a "Whoopee!" What I got shocked me. My daughter said she wants to take the tests. My daughter explained that she must take the common core tests because she has a high grade average. My daughter feels very strongly that she will not be recommended for advanced placement classes next year if she doesn't take them. "Dad, I've worked so hard all year and now this will be held against me. Just let me take them." What the heck could I say? No? Risk her being placed in a remedial class as punishment for all of next year? Would this happen? I don't think so, but the kids sure think it will. What about the parents of kids who are undocumented? They're scared to death to opt out. We also got a robo- call saying state funding for the school would be cut if parents opted their children out. This is not what education should be about. Teaching and learning should be a joyful experience for students and staff. This is not education; this is now a business.